Details of all friendly fixtures for the 2019/20 season are now on the 2019/20 Fixtures page. All fixtures for CMBL, NWEBA & NWELT leagues for the 2019 season are now available on this website. The FINAL results of our outdoor season friendly fixtures can be found on the 2018/9 Fixtures page. The FINAL Tuesday morning pairs league table has been uploaded. Congratulations to Team A for winning this season. The FINAL Club Night table has been uploaded to include all this seasons results. Congratulations to Trevor Blake for coming first and therefor winning the Briggs Cup for the 2018 season Special mention for Bev Waller (Best Lady) and Bob Brandon (Best Gentleman) for coming runners up. WITHAM Bowls Club played hosts to the Dennyside Bowling Association [the rabbits] for a charity match in aid of Farleigh Hospice. It was an honour for Witham B.C to host the 'rabbits passing by' and the tremendous contribution they, and our own members, gave to a very successful day all round. We were astounded by the generosity and support that everyone gave on the day. Winners on the day were Farleigh Hospice - we raised £1,800 and the sport of Lawn Bowls. WITHAM Bowls Club provided the home comforts as they hosted the Essex Past Presidents against Kent Past Presidents resulting in a win for Essex. Meanwhile, the club's recent annual President versus Captain game, President Jenny McDonald beat Captain Pat Brown and Witham's ladies had a very good win in the Albert Crabb as the defeated Dovercourt Ladies. Witham also hosted a successful Open Day with several members joining and anyone interested in playing bowls can contact the club. Details of all friendly fixtures for the 2018/9 season are now on the 2018/19 Fixtures page. All fixtures for CMBL, NWEBA & NWELT leagues for the 2018 season are now available on this website. The final of the 2 Wood Triples was played today resulting in a win for Team G Pat Brown. See honours page for further details. Full details of our Finals Day results are now shown on the 'Honours Page". All of our outdoor friendly fixtures have now been played and the complete results can be found on the 2017/8 Fixtures page. What a great day, we raised £ 1,080 for the charity. Heartfelt thanks to everyone who attended, not forgetting those who couldn't be there on the day and still contributed to the magnificent total. 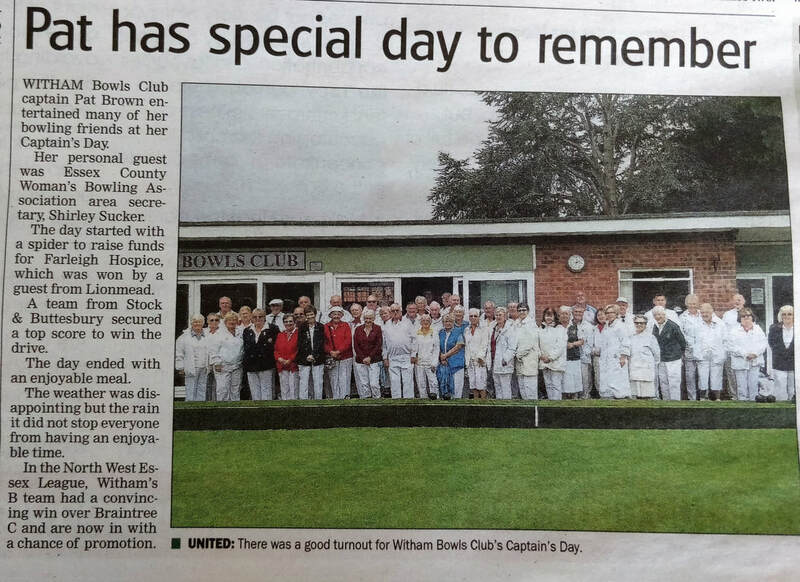 We should all be proud to be called WITHAM BOWLS CLUB. Have a look at the Photo Gallery (under more...) for pictures of the day. Our B Team for finishing as runners-up in the 2017 Central Midweek Bowling League, Division 3 and gaining promotion for the second year in succession. Here is a link to the final CMBL League Tables. Unfortunately our A Team finished in 7th position in Division 1 and therefore are relegated. Consequently both teams will be competing in Division 2 in the 2018 season - that should be interesting! All fixtures, for both friendlies & leagues, for the coming 2017 season are now available on this website. The indoor friendlies for 2017/8 have also been uploaded with the most up to date information to hand. Weather permitting the green will be open for roll-ups from Monday 17th April 2017, afternoons only. Our FIRST game (President vs Captains) will be Saturday 22nd April 2017, start time of 2.00pm with the FINAL game (Ladies vs Gentlemen) on Saturday 23rd September 2017. Details of our friendly fixture results FOR THE WHOLE SEASON can now be found on the 2017/8 Fixtures page. The awards for the clubs competitions have been presented - detail are on the honours page and photos can also be found in the gallery﻿﻿﻿﻿. The FINAL Club Night 'league' table (under more...) now updated for the current season﻿﻿﻿﻿. Congratulations to Kevin McDonald for winning this year. B Team for winning the 2016 Central Midweek Bowling League, Division 4 and gaining promotion. A Team for being 2nd in the 2016 Central Midweek Bowling League, Division 2 and gaining promotion. On Friday 22nd July our lady captain, Pat Brown, invited ladies from 17 clubs for an afternoon of fun bowling. A good time was had by all and the spider raised an amazing sum of £ 124 which will be sent to Cancer UK for their work on breast cancer - Thanks to all who gave so generously. Pictures of the event have been uploaded to the Photo Gallery page. All fixtures, for both friendlies & leagues, for the coming 2016 season are now available on this website. The indoor friendlies for 2016/7 have also been uploaded with the most up to date information to hand. Weather permitting the green will be open for roll-ups from Monday 18th April 2016, afternoons only. Our FIRST game (President vs Captains) will be Saturday 23rd April 2016, start time of 2.00pm with the FINAL game (Ladies vs Gentlemen) on Saturday 24th September 2016.